Kansas’ size proved to be a little too much for Toledo to overcome Monday evening as the Rockets dropped a 93-83 decision to the No. 16 Jayhawks at Allen Fieldhouse in Lawrence. 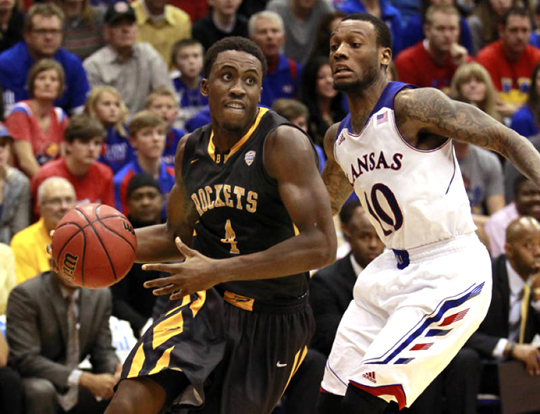 Junior Justin Drummond scored 13 points in the Rockets’ 98-83 loss to Kansas. The loss was UT’s first of the season, dropping its record 12-1 heading into Mid-American Conference play next week. Sophomore center Nathan Boothe paced a balanced Rocket attack with 15 points even though he was saddled by foul trouble and played just 23 minutes. Also scoring in double digits were juniors Justin Drummond and J.D. Weatherspoon with 13 points apiece and senior guard Rian Pearson with 10 points. Junior guard Julius Brown was just shy of double figures, finishing with nine points while dishing out five assists and committing just one turnover. Toledo committed just eight turnovers in the contest, while forcing the Jayhawks into 18 miscues. But Kansas overcame that sizable difference with a commanding 44-28 advantage on the glass. Sophomore forward Perry Ellis (21 points, 11 rebounds) and freshman center Joel Embiid (14 points, 10 rebounds) each registered double-doubles, while junior guard Naadir Tharpe and freshman Andrew Wiggins each scored 20 points apiece. Toledo scored the game’s first five points, and Kansas Head Coach Bill Self called timeout just 35 seconds into the contest after the Jayhawks committed turnovers on their first two possessions. KU took its first lead, 17-15, on Wiggins’ three-point play with 11:57 remaining in the first half. The Rockets quickly answered thanks to seven straight points from Boothe for a 22-17 lead at the midway point of the opening stanza. Tharpe responded with an eight-point burst of his own to give the hosts the lead for good, 25-22, less than two minutes later. Toledo reduced its deficit to one point on four occasions the remainder of the half, but the Jayhawks went on another spurt to take a 43-36 halftime advantage. The Jayhawks carried that momentum into the second half and widened their lead to 57-43 on Ellis’ three-point play with 15:34 remaining. Toledo proceeded to cut its deficit in half thanks to a Boothe jumper followed by a layup and three-point field goal from senior forward Matt Smith. Kansas restored its cushion back to double digits until a Pearson jumper brought the Rockets within 79-70 with 6:42 to play. UT had chances to draw even closer but came up empty on its next four possessions. Ellis finally ended KU’s scoring drought with a layup forcing Toledo to take timeout with just under four minutes left. Brown hit a corner trey to cut the Jayhawks’ lead to 81-73 following the stoppage, but that was as close as the Rockets would get. Toledo will return to action next week with its conference opener at MAC West Division foe Western Michigan on Wednesday, Jan. 8, at 7 p.m.
Senior outside hitter Lauren Rafdal continued to receive accolades for her tremendous 2013 campaign by being named an Honorable Mention All-American by the American Volleyball Coaches Association. She is the first Rocket in the program’s 34-year history to receive this honor. “Lauren had a wonderful senior year, and it’s great that she’s being recognized for her hard work,” Head Coach Greg Smith said. 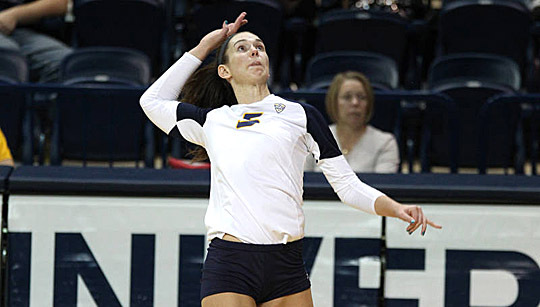 Rafdal, who led Toledo with 3.97 kills per set and ranked third in school history with 492 kills, paced the Rockets in kills in 25 matches this year, including 16 of her last 17 contests. She was the MAC leader in league play with 4.27 kills per set and was the only player in the conference to average four or more kills per set. Rafdal registered the top two kill totals in the MAC this season with a career-high 28 and a .300 attack percentage vs. Ball State (Oct. 3) and 27 vs. Northern Illinois (Oct. 11). She also tallied a career-best .500 attack percentage vs. Akron (Oct. 5) with 18-1-30 totals. She ranked second on the team in conference action with 2.67 digs per set, including a career-high 21 digs at Buffalo (Nov. 9). As a team, Toledo captured its first MAC West Division title ever thanks to a school-record 12 league victories and finished with a 19-12 overall win-loss mark. Toledo will host its third annual Rocket Women’s Basketball Educational Day Thursday, Jan. 9, in conjunction with its Mid-American Conference game against Northern Illinois at 11 a.m. in Savage Arena. First- through eighth-grade students, teachers, administrators and chaperones from schools in northwest Ohio and southeast Michigan are invited to spend the day in Savage Arena with the Rockets, as well as celebrate education and learning. The entire day will be organized to show youth the importance of education and how what they are learning in the classroom can be related to sports and other fun aspects of life. Every group will receive Rocket educational workbooks for their students and teachers that are appropriate for their class grade and educational level. Workbooks will be based on the Ohio and Michigan educational standards covering math, geography, problem solving, English, reading, music, art, physical education and more. During pre-game festivities, UT Head Coach Tricia Cullop will speak to the students and educators in attendance on the importance of education and how it has had a positive effect on her life. Throughout the contest, there will be pre-recorded messages from Toledo players and educational pop quizzes. After the game is over, the Rockets will be on the west concourse of the arena to sign autographs. Tickets for this event are $3 per person (students, teachers, chaperones, bus drivers and guest) when 10 or more tickets are purchased. To reserve tickets or for more information, contact Heather Lutz, UT assistant athletic director for marketing and sales, at heather.lutz@utoledo.edu or call 419.530.2486. 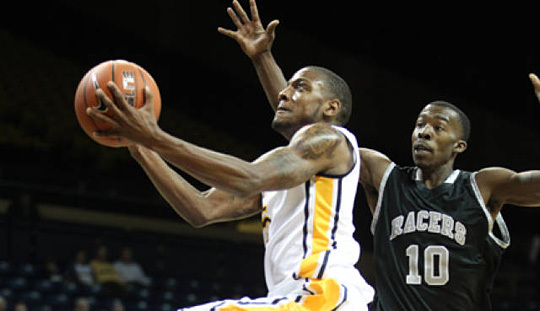 Toledo started strong and never trailed Saturday afternoon as the Rockets remained unbeaten with an 85-66 triumph over Coppin State in Savage Arena. With the victory, UT improved to 12-0 to match the 1940-41 squad for the second-longest unbeaten start to a season in school history. Senior guard Rian Pearson paced a balanced Rocket attack with a game-high 22 points; junior guard Julius Brown (18 points), junior guard Justin Drummond (13 points) and senior forward Matt Smith (season-high 10 points) also scored in double figures. Toledo dominated the glass for a third straight outing with a commanding 47-25 rebounding advantage. Over its last three contests, UT has outrebounded its opponents by a 136-84 margin. Freshman guard Jordan Lauf led the Rockets’ rebounding efforts with a season-high 10 caroms, with junior forward J.D. Weatherspoon tying a season best with nine boards. Brown also spearheaded the Rocket offense with a game-high seven assists to help UT tally 19 helpers as a team with just 11 turnovers. Toledo shot 49.2 percent (29 of 59) from the field and limited the Eagles to a 39.7 shooting mark (23 of 58). Senior guard Andre Armstrong came off the bench to lead the Eagles with 15 points. Toledo took control in the latter stages of the opening stanza, ending the half on a 16-2 run for a 44-24 halftime advantage that was the Rockets’ largest lead after 20 minutes this season. UT increased its lead to 22 points early in the second half before the Eagles rallied to within 71-58 with five minutes to play. Brown was able to restore the Rockets’ cushion back to 20 points at 82-62 though with a trey at the 2:06 mark. Toledo has a quick turnaround as the Rockets return to action Monday, Dec. 30, with a trip to Lawrence, Kan., to battle No. 16 Kansas. Tip-off time from Allen Fieldhouse is 7 p.m. Central/8 p.m. Eastern. The game can be seen on ESPN 3. As a child, Dr. Jeanine Diller was inspired by her parents, her friends and her faith to give to others. As an adult, she is the inspiration for others to do the same. 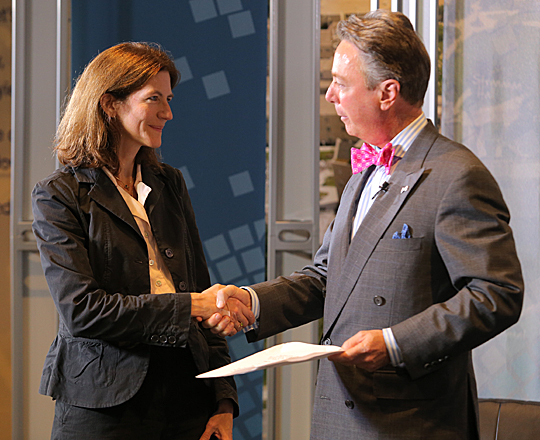 Dr. Jeanine Diller, assistant professor of philosophy and director of the Center for Religious Understanding, received the UT Jefferson Award for September from Lawrence J. Burns, vice president for external affairs, during Inside Toledo in November. Diller, UT assistant professor of philosophy and director of the Center for Religious Understanding, was named the University’s Jefferson Awards September honoree because of her role as a mentor to students, encouraging them to live a life of service. Through the Center for Religious Understanding, Diller helped organize an after-school program with two goals: to help at-risk youth realize that college is a possibility and to encourage interfaith discussion among the volunteers. This two-part goal came from a challenge from President Obama for people of all religious perspectives to come together for community service. She and Dr. Sudershan Pasipuleti, UT professor of social work, accepted this challenge and have received help from many to make their goals a reality. Dehm, who graduated from UT in May and is studying theology at the Boston College School of Theology and Ministry, nominated Diller for the Jefferson Award. Know an unsung hero who dedicates his or her time to volunteering and community service? Submit a nomination for the Jefferson Awards at utoledo.edu/jeffersonaward or on Facebook at facebook.com/utjeffersonawards. The number of students pursuing degrees in science, technology, engineering and mathematics (STEM) is dropping nationwide, but educators at The University of Toledo are doing something about it. In October, Leaman and three faculty members from his department were named National Academies Education Fellows in the Life Sciences for the 2013-2014 academic year. The group includes Dr. Brenda Leady, lecturer; Dr. Robert Steven, assistant professor; and Dr. Tomer Avidor-Reiss, associate professor. As fellows are using teaching methods they gained at the 2013 National Academies Northstar Summer Institute on Undergraduate Education in Biology. The methods were created at the institute to transform education and retain STEM students. For the first three days, attendees watched presentations on scientific teaching, diversity, assessment, active learning and institutional transformation. During this time, and for the remaining two days, they also applied this knowledge by working in small groups on different projects that they later presented to the whole group. Leaman said that the work they did was less about the content and more about the process of learning. When the conference ended, the fellows were tasked with presenting what they learned to their institutions and continuing to communicate with the National Academies. Leaman hopes to send another group next year. This year’s trip was made possible with support from UT President Lloyd Jacobs and Dr. Karen Bjorkman, dean of the College of Natural Sciences and Mathematics. Three UT graduate students won awards for their presentations at the joint annual meeting of the East Lakes Division of the Association of American Geographers and the Ontario Division of the Canadian Association of Geographers. The annual meeting took place on UT’s Main Campus during fall semester. In a letter to the campus community Wednesday, David Morlock, executive vice president for finance and administration and chief executive officer of the hospitals and health centers, announced a series of administrative changes within his division beginning Jan. 1. • Joy Seifert, director of auxiliary services, reporting to Lehnert on an interim basis. “Thanks to all for your help making these transitions as seamless as possible and for the warm welcome I’ve received since becoming a Rocket,” Morlock said. The new chief executive officer overseeing The University of Toledo Medical Center sees this time of transition for the hospitals and health centers as a time of “great opportunity,” as articulated in a memo that was circulated to Health Science Campus faculty and staff Friday afternoon. David Morlock, executive vice president for finance and administration, has been asked by President Lloyd Jacobs to take on additional responsibilities as chief executive officer for hospitals and health centers, coinciding with the departure of Dr. Jeffery Gold, chancellor, executive vice president for health affairs and biosciences, and dean of the College of Medicine and Life Sciences. “I consider myself extremely fortunate, not only to have been asked to add the additional role as chief executive officer for the hospitals and health centers, but also to have such a great team to work with now and moving forward,” Morlock wrote in the memo. “While I learned a lot during my many years with the University of Michigan Health System, I will spend the next several weeks learning more about UTMC and where we need to focus our attention,” Morlock added. Morlock has more than 24 years of experience in health-care finance, in organization leadership, strategy, finance and business development. He was the chief financial officer and senior associate director of the University of Michigan Health System, working with the university for more than 20 years before joining UT in September. 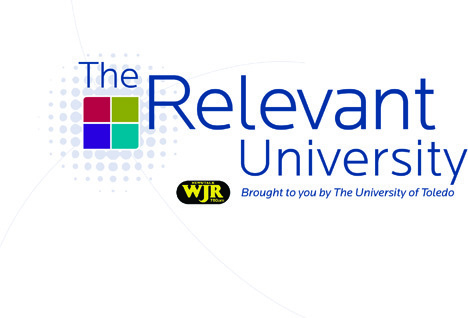 Tune in to “The Relevant University” Monday, Dec. 23, at 7 p.m. on AM 760 WJR. This month, Lawrence J. Burns, UT vice president for external affairs, gets ready for the holiday and winter sports seasons. • UT Coach Tod Kowalczyk talks about the men’s basketball team’s strong start to the season. • UT Coach Tricia Cullop shares what’s in store for the women’s basketball season that will include hosting the 2014 NCAA Tournament in Savage Arena. • University of Michigan Associate Athletic Director Rob Rademacher discusses converting “The Big House” into a hockey rink for the NHL Winter Classic. • And UT Vice President and Athletic Director Mike O’Brien announces a renovation of the Larimer Athletic Complex. Throughout the program, listeners will hear samples of songs from a recent UT Jazz Holiday Concert featuring music legend Jon Hendricks and the faculty group CrossCurrents. The University and Detroit’s WJR produce the monthly, hourlong program that explores the critical role higher education plays in our world.